Lack of bathroom storage is a common problem. Bathrooms are usually small, even in a larger home, and they are notorious for lacking storage space. 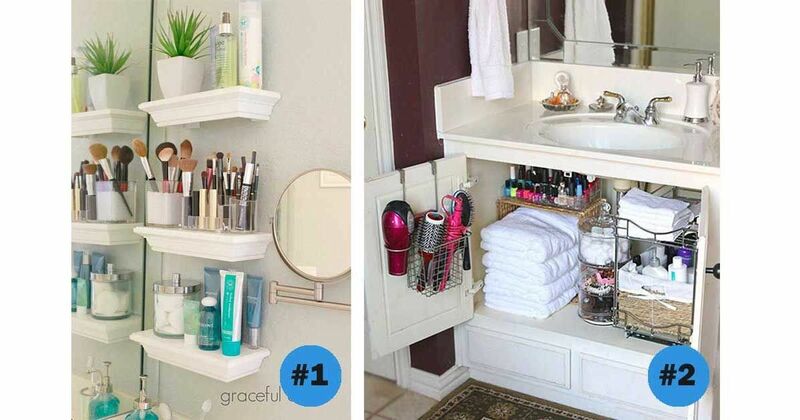 If you are living in a small home, bathroom storage is practically non-existent. Your bathroom does not have to be a disorganized mess. 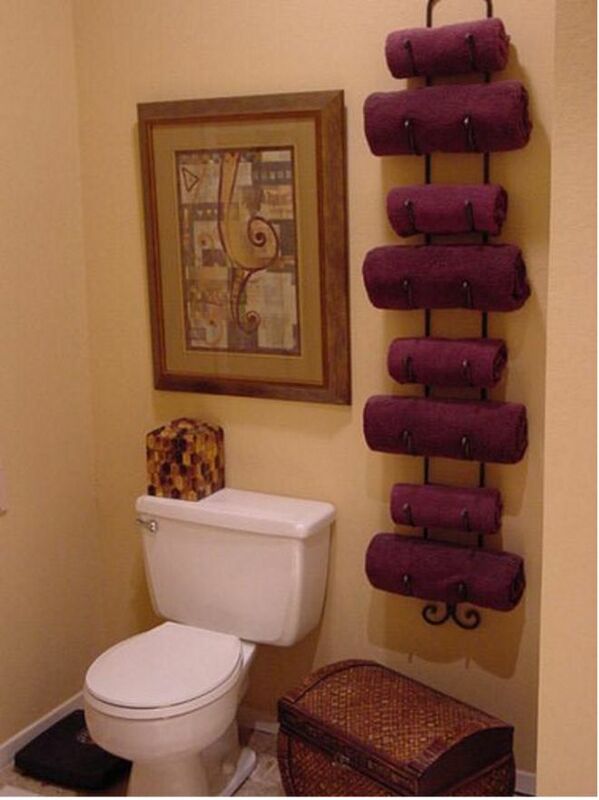 With a little creativity, you can save room and make your small bathroom more functional. 1. Store away your styling devices, as shown by Rachael Hair Stylist. This fun idea is both cheap and easy. All you need is a few plastic hooks (you can find these at most stores for less than $5.). 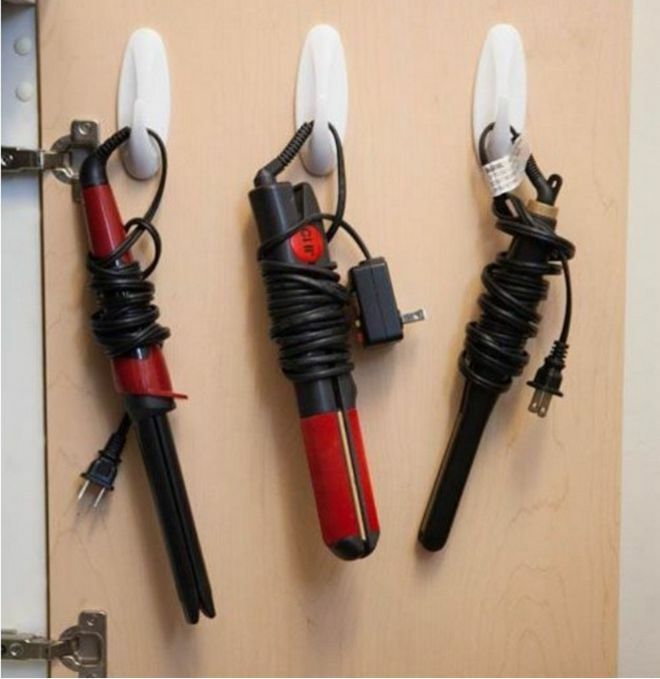 Simply attach them to the back your bathroom door, or inside a cupboard and hang your hair-styling equipment when you are done using it. You'll save space and keep the cords from become a tangled mess. 2. 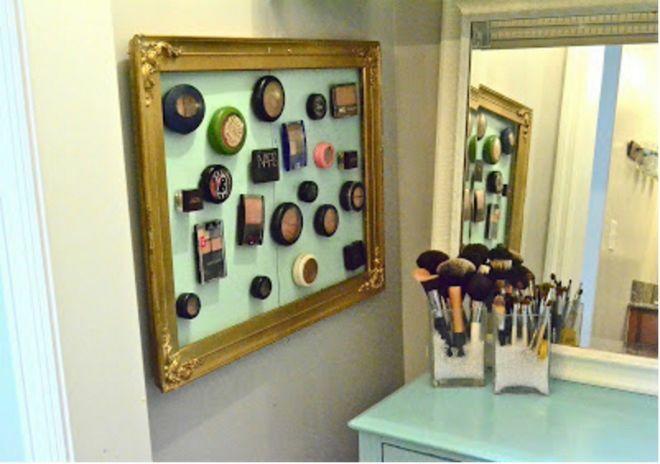 Organize makeup on a magnetic board, like Liz Marie. Ditch the bulky makeup cases and keep your drawers clean with this fun twist on makeup storage. Liz Marie used an old frame and magnetic board to create the perfect space for her makeup. Simply attach magnets to the back of your makeup and hang. You'll save time digging through drawers looking for your favorite eye shadow and you'll have a one-of-a-kind bathroom wall hanging. 3. If you have a narrow sink with no room, this idea by Graceful Order is for you. Those pedestal sinks are adorable, but they are not the least bit practical if you need to store anything. If you have a small sink with no storage, create your own with these small shelves. Attach these to the sidewall next to your sink and presto: instant, attractive storage for your bathroom goods. 4. No closet in your small home? You can use a wine rack to store away your towels, seen on Flickr. 5. Create a mason jar organizer, as shown by The DIY Playbook. Mason jars are a fun item to use for decorative storage. The old style adds a fun twist and requires little or no sprucing up. Use hose clips to attach your mason jars to a stained piece of wood and attach to your wall. This DIY project is easy to customize and lets you store a variety of loose items. 6. 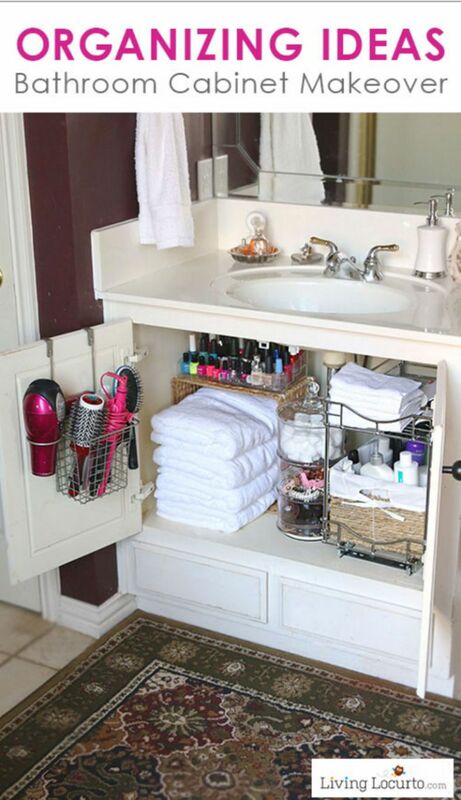 If you have a small cabinet in the bathroom, planning is key, like in this idea by Living Locurto. Maximize the space you do have. Adding hanging shelves to the inside of your under-the-sink storage keeps brushes and hair care items organized. Try adding some shelves for extra storage space too. The shelves allow you to store more items, and stay organized, by taking advantage of empty space. 7. Create extra storage space above the door, like The 2 Seasons. Talk about wasted space. That narrow wall space above your bathroom door may be just big enough to fit a small storage box. 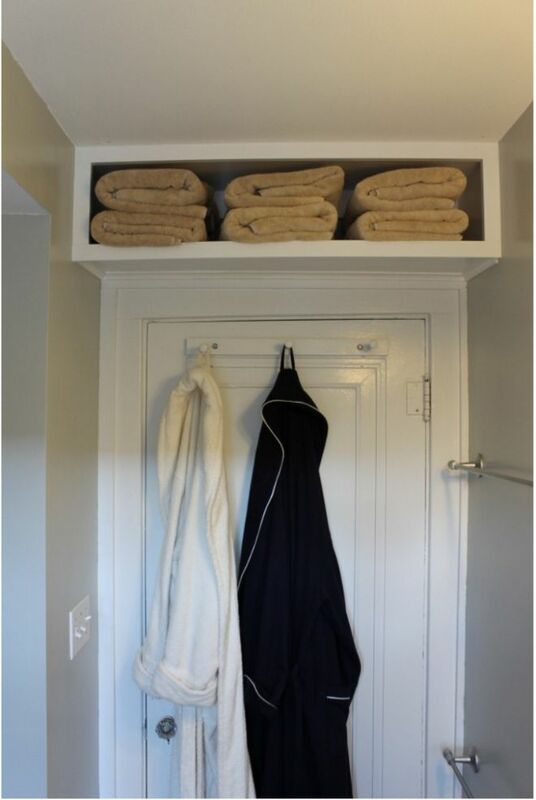 Use this new storage space to keep towels or extra bathroom supplies out of sight, but within easy reach. 8. A curtain rod in the shower multiplies your storage space, as seen on Cute Decor. If a million bottles sitting on the edge of the tub drives you nutters, try hanging an extra shower curtain at the back of your tub. 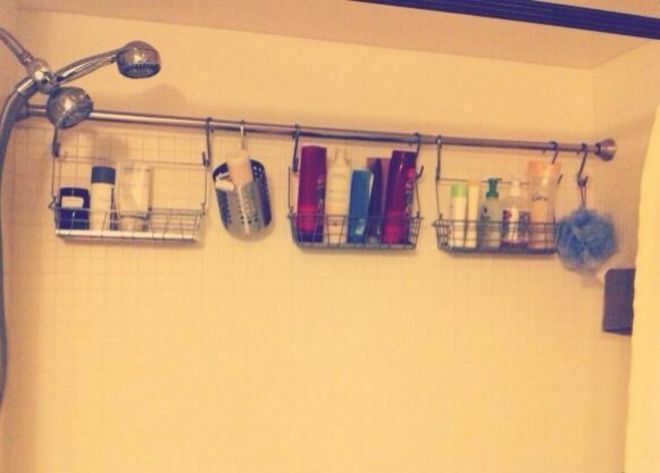 Add hanging shelves and store your shampoo and body wash out of the way. This can help eliminate spilled shampoo and make your bathroom feel more put together. 9. A curtain rod helps with toys too, as The Inspired Home demonstrates. 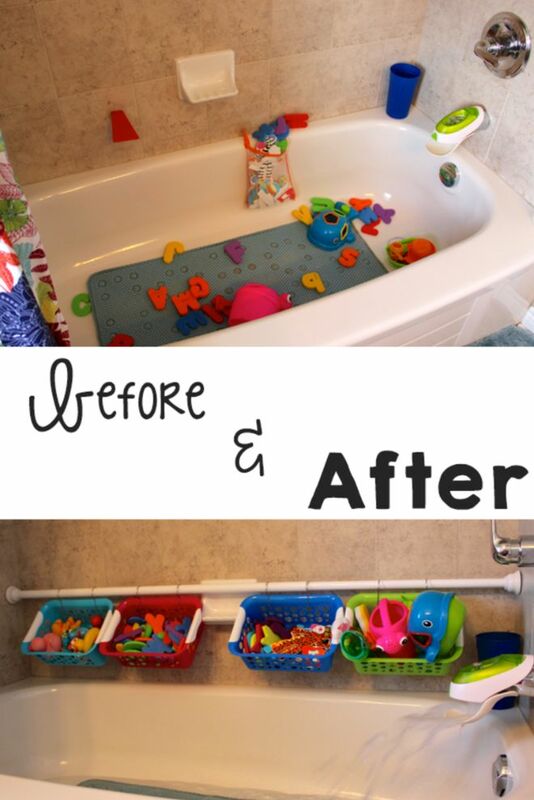 Shower rods can help you keep the bath toys out of the way too! Hang a rod lower in the shower (easy access and easy clean up). Attach baskets to the rod using zip ties. Remember to choose baskets that allow water drainage to avoid mold and bacteria build up. Toy clean up has never been so easy! 10. Small bathroom with no cabinets? Try a hanging shoe rack, seen on Jenna Burger. The hanging shoe rack offers plenty of storage solution options. 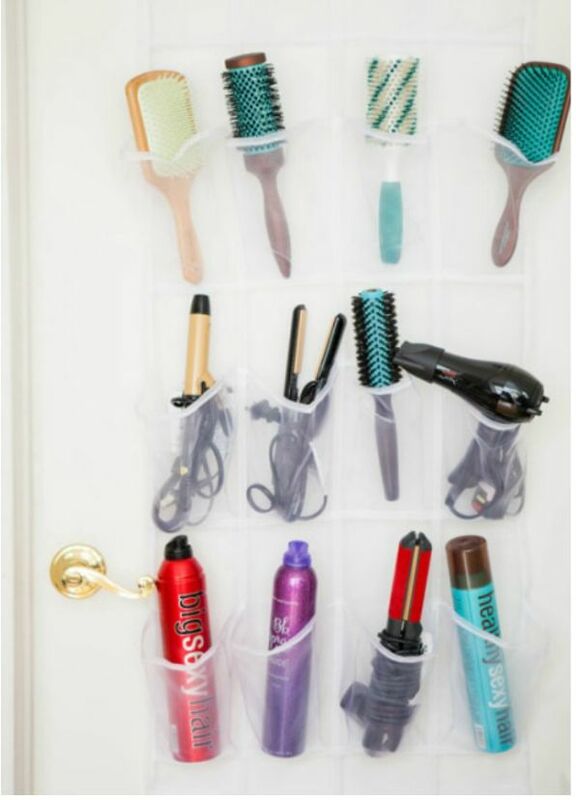 Try hanging one on the back of your bathroom door to keep your hair essentials out of the way. You'll be able to see what you need so you can save time in the morning and these loose items will be out of the way so you can use your drawers for other items. (Remember to let your hair appliances cool before storing or you may find a melted mess waiting for you later). 11. A bathroom with drawers but no counter-top space also has a solution, as shown by Little Penelope Lane. Keep your bathroom sink clutter free with a silverware holder. Yup. Head to the kitchen aisle and your local super store, and snag a budget-friendly silverware drawer organizer. These are perfect for keeping toothbrushes in order. 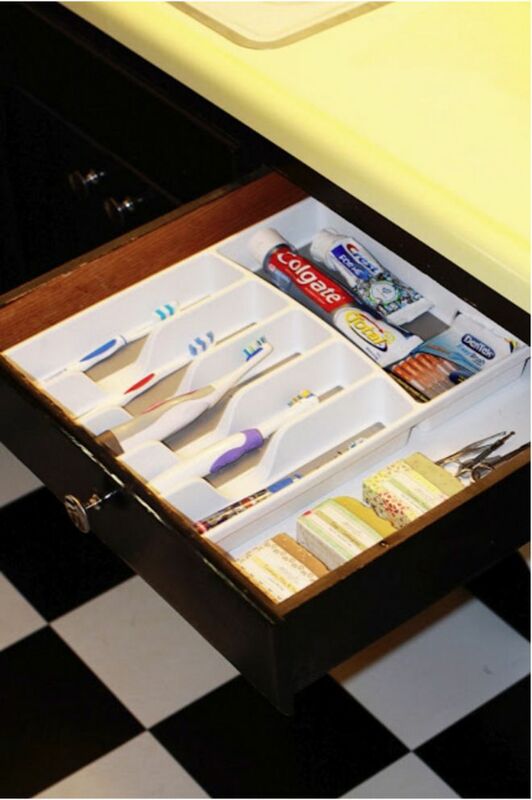 Store toothpaste and other items in the bigger slot. When it gets dirty, you can pull it out and toss it in the dishwasher for a quick clean. 12. 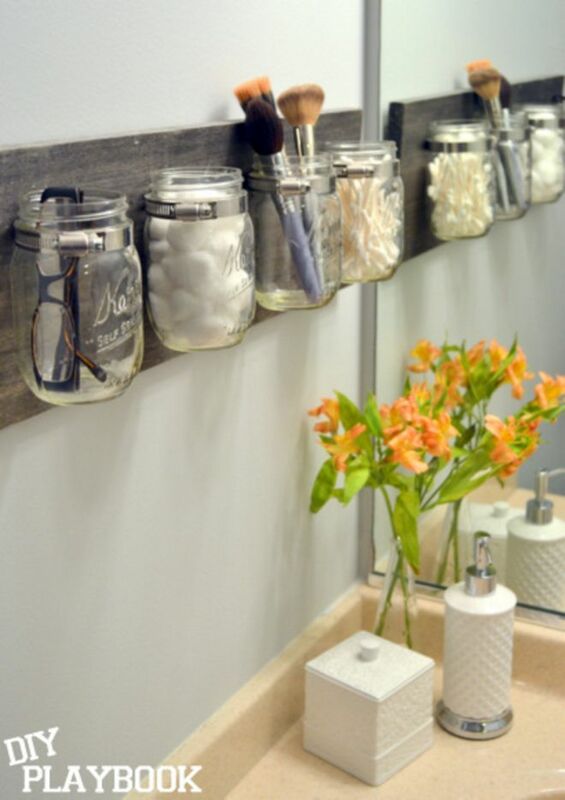 DIY bathroom storage with integrated mirror, by Shanty2Chic. This storage solution is love-worthy! 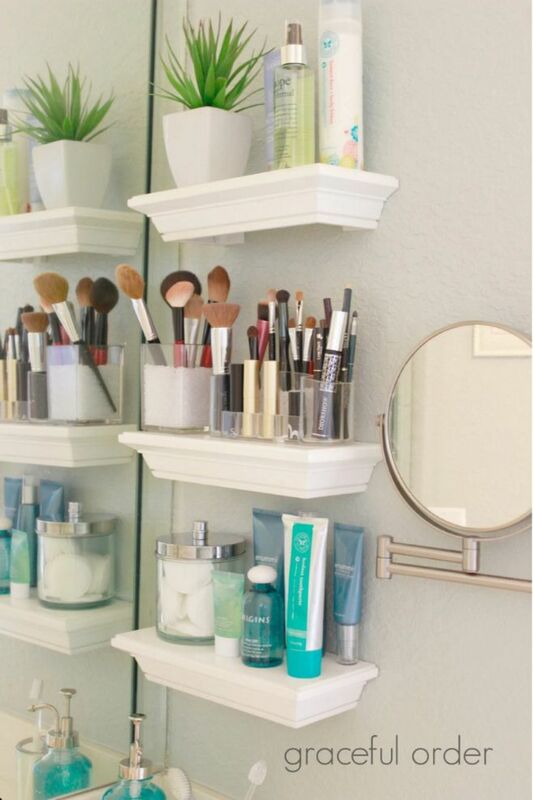 Turn your full-length mirror into extra storage. 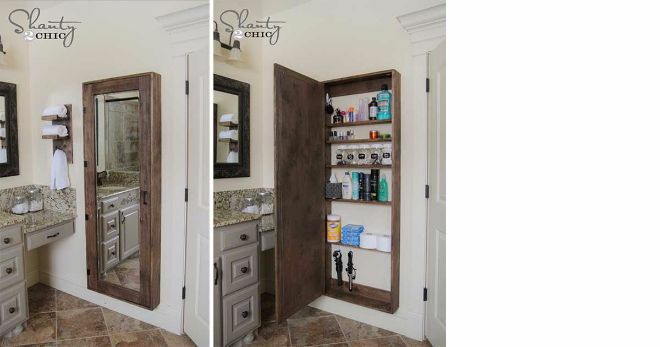 This open-mirror takes medicine cabinets to an entirely new level. Taking up just an extra few inches of space, you can store all of your toiletries out of sight behind this beautiful mirror. 13. 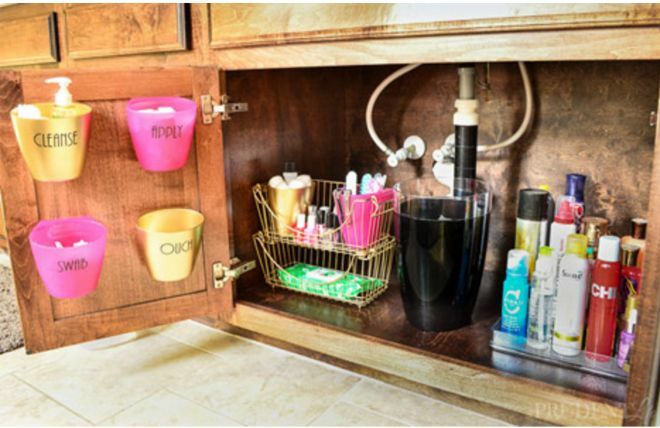 Storage bins make under the sink organization much easier, as shown by Polished Habitat. When you just want to keep it simple, grab a few containers and create specific zones for items. Use small baskets (check the dollar store) to hang small loose items on the back of the door. Then grab stack-able storage bins for makeup and other goods. Keep your hair products in line with a shallow container. At the very least, this will make it easier to keep your under-sink storage orderly. What are your favorite bathroom storage hacks? Share your ideas in the comments below.